We take great pride in our printing service, Just send us a good copy of your design and we will do the rest. If you haven't got a particular logo, then our artwork department can easily set up a simple worded message for you, and add an appropriate stock design if required at no extra charge. 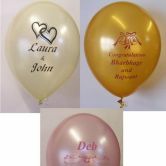 We like to fax or email you a proof of the design before we print the balloons, in order that you can check the spelling and layout. This should prevent any possible mistakes from occurring. We want you to be 100% happy before we start. Each balloon is inflated during the printing process this pre-inflation quality checks each individual balloon and ensures that the print is as dark as possible to guarantee best possible results. 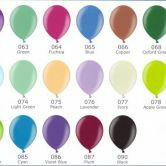 We can offer an extensive colour range of high quality balloons, our range has 27 different colours to choose from. Over the years we have always worked hard to provide outstanding service and many of our customers return again and again for repeat orders. Printing will normally be neck downwards (The correct way for helium gas filling or for airfilled balloons on sticks) unless you specify otherwise. Delivery is normally about 14 days from signing off the final approval of your design. For balloons in less than 14 days please use our express service. £4.75 extra per 100 balloons. Details of your required message and layout - or send us a high resolution 400dpi when image measures 125mm across or preferably an eps file in pc format. Contact daytime telephone number and email address. Delivery address if not picking order up from shop (please note delivery will need to be signed for). Please let us know if you need the balloons by a specific event date. shop to allow your order to arrive in time for your event.